A home owner in Sydney’s north shore approached us with a sun control issue. This problem is often seen in residential and commercial apartments, managed by strict guidelines and body corporate. Heat was the biggest issue during the summer. Intensified on summer afternoons, as the direct sun in the kitchen made the room overheat despite the air conditioning running at full capacity. Another issue was the fading of the new kitchen doors as the sun streamed in. To control the heat & damaging UV rays of the sun, the owner would have had to put an awning on the exterior of the building with heavy duty blinds. However, this would compromise the view and defeat the purpose of having glass installed in this area. The home owner did not want to change the external and internal look of the building. Traditional window films are either dark or highly reflective and change the external appearance of the building, giving a patchwork effect if some areas are tinted and other areas are not. 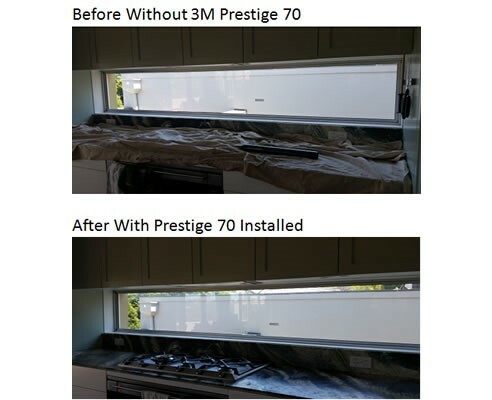 Given its innovative multi-layer optical film technology, 3M Prestige 70 was used due to its clear appearance and other advantages. Some of these benefits include enhanced angle performance, high IR reduction, superior clarity, no chance of corrosion, and no signal interference. 3M Prestige 70 film gives low reflectivity and an optimized balance of performance and natural light. While essentially not changing the external appearance of the building, it reduces 97% of Infrared Heat which accounts for 50% of all heat, 23% of glare and 99.98% of UV rays. The 3M Prestige Series is a significant technological advancement in how window films can enhance buildings and homes. Residential and commercial property owners now have a high performance clear window film that combines all the benefits of heavily-tinted or reflective films, without the inherent drawbacks of darkened rooms or mirrored windows. Prestige films have 1% higher reflectivity than the glass they cover, so the appearance of your building is virtually unchanged. We performed the installation (1 window) which resulted in virtually no disruption to the owner, with a straight-forward and trouble-free installation within one hour. The results were immediately noticeable. With the air conditioning running at a lower level, the savings in energy costs in summer would be substantial. For more information please contact your local team or read more about the 3M Prestige Series Window Films. We are a licensed 3M window film installer, offering protection, cost-effectiveness and energy-saving solutions that will last for years. Backed by manufactures warranty, and our state-of-the-art equipment and highly-trained staff, you will get the best guidance, installation and resources regardless of project size.